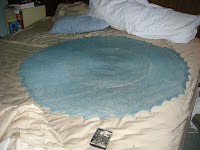 To block it, I had to stretch it out on our kingsize bed (to give you some perspective), but it's so soft and light it feels like a cloud (without the damp cold). We spent several days there since it's been months since we've been up there. 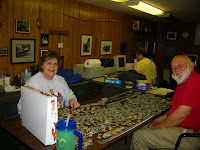 We did puzzles, played games (together, and individually on their computers), and did some traditional Xmas things. We spent time with my brother and his GF. We made some traditional Swedish dishes (from my paternal grandfather's mother's tradition) of Sylta and Barley(made using the broth from Sylta and adding enough barley to choke a horse, then mixing in ground liver - not my kind of dish, but DH lurves it big time) DH has some good bonding time with my 'rental units by making this with them every few years. and I made Swedish Limpa Rye Bread to go with it. I didn't use the linked recipe, but instead used one from an old cookbook Mom has from the Swedish church in town. This is about the only rye bread I enjoy. It's got a lovely sweetness from the molasses, and a bit of light tang and bouquet from the orange zest. 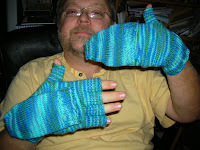 And I got DH to pose with his new convertable glove/mittens. Isn't he cute? He lurves these, too, and gave them a test-run today for the annual Christmas Bird Count in the Hocking Hills. My gosh you are talented. The shawl and the glove/mittens are just beautiful. Love to hear about great family Christmas times. the shawl turned out beautifully. it sounds like you had a wonderful time. I'd love to get a look at that cookbook.